Thermacell’s newest camping lantern delivers superior insect protection in a rock-solid lighting platform. One of the things we’ve learned about dual-purpose products during our years of evaluating camping gear is that while the concept of killing the two proverbial birds with one stone often sounds great, reality sometimes doesn’t stand up to the hype. Too often we’ve seen a product designed to perform two separate functions, yet do neither function as well as their single-purpose counterparts. That is certainly not the case with the all-new Thermacell Repellent Camp Lantern. Designed as a sturdy, portable light source and best-in-class insect deterrent, this multi-function lantern excels at both job descriptions. The Thermacell Repellent Camp Lantern is a genuine two-in-one product that delivers maximum results both as a lantern and as an effective insect repellent system. The Thermacell insect repellent system has earned its chops in the field under the most challenging conditions. From the mosquito-infested southern swamps to the black fly-choked waterways of the far north, hunters, anglers, and outdoor adventurers have come to rely on Thermacell products’ proven ability to keep the flying, biting critters away. By vaporizing the repellent, the Thermacell system provides a broad, 15×15-foot protective zone that insects are loathe to enter. If you’ve ever used a Thermacell insect repellent product, such as their personal Mosquito Repeller, you already know that Thermacell wrote the playbook for keeping mosquitos, black flies, and no-see-ums at bay. Utilizing allethrin, a synthetic compound that mimics the natural insect-repelling chemical found in the chrysanthemum flower, Thermacell products employ a butane-powered heat source to vaporize the repellent and provide a 15×15-foot wide-area protection radius from biting insects. There is no need for messy, smelly topical insect repellents, and no need for noisy bug-zappers (which no one wants to hear when enjoying the quiet solitude of a backcountry camp). The insect repellent is practically odor-free, and there is no open flame. Operation of the Thermacell repellent system is simply. Install the butane cartridge into the top of the globe, secure the two halve together, insert the repellent mat, raise the bail, rotate the starter ring to “start” and release. To turn it off, rotate the starter ring to the “off” position. The other side of the Thermacell Repellent Camp Lantern is, well, the lantern. 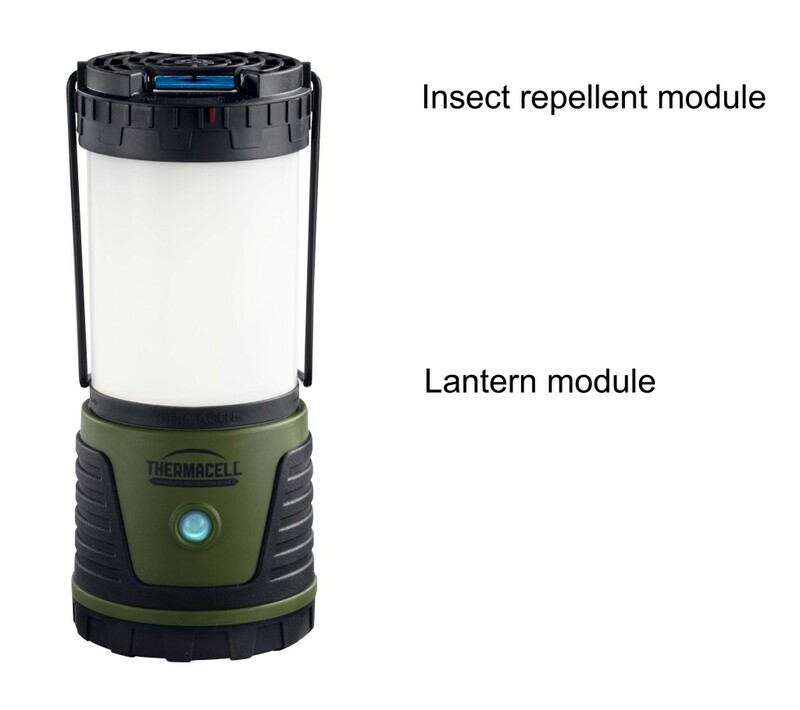 This isn’t the first time the company has combined lighting with its insect deterrent technology, but it is Thermacell’s first lantern platform built to the expectations of serious campers. We say this because we’ve tested similarly designed military- and expedition-grade lanterns, and the Thermacell Repellent Camp Lantern can stand confidently alongside them. The slim profile of the Thermacell Repellent Camp Lantern makes it easy to stow or place around your camp. Flip up the bail and suspend the lantern from a hook or limb. Separate the upper and lower halves of the lantern and hang the lantern from its base hook to provide brighter, direct lighting around your camp or in your tent (we found this feature to be ideal for cleaning fish after dark). 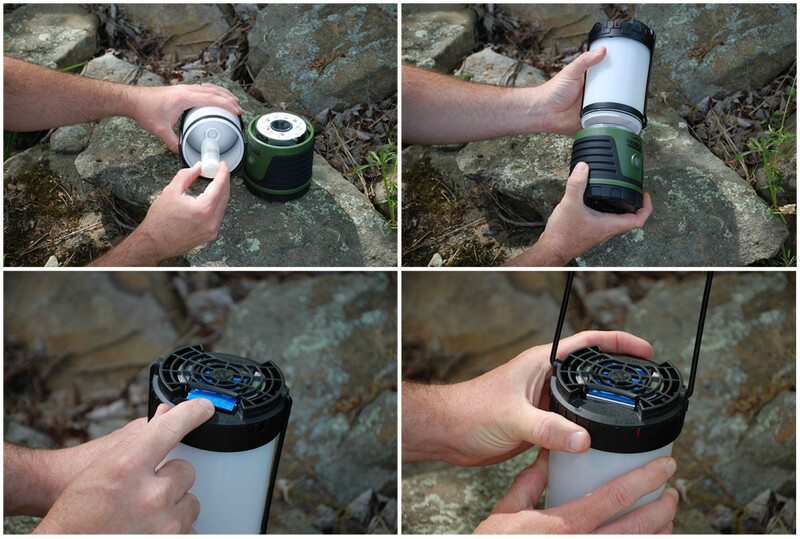 The ability to separate the Thermacell Repellent Camp Lantern into two independently-functioning units makes it a versatile tool across multiple camping environments. Sometimes hanging a lantern is not an option. Thanks to its weighted bottom, low center of gravity, and no-skid rubber base, this lantern can perch on most anything without sliding off, and it will not easily tip over. 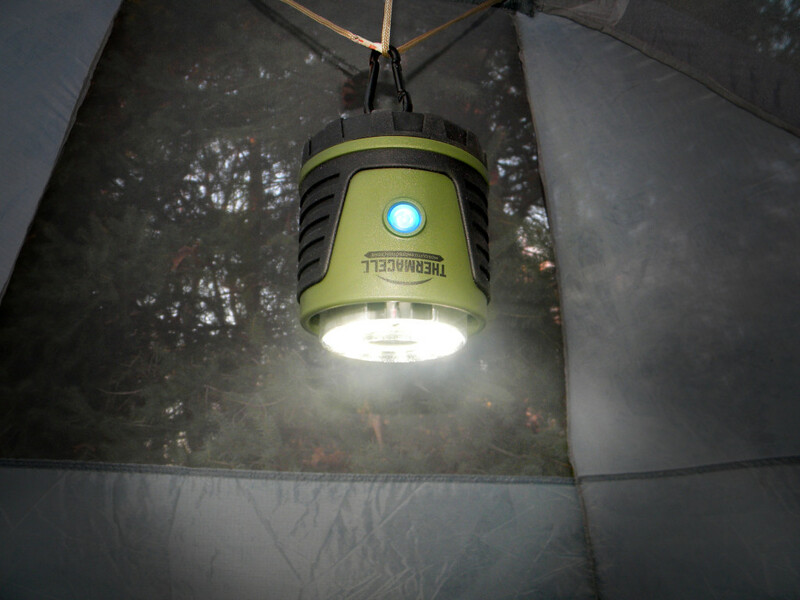 Although the Thermacell Repellent Camp Lantern is an optimal piece of after-dark camping equipment, especially since bugs and campers alike gravitate toward the light after sunset, the lighting and repellent systems function independently. On nights when the bugs aren’t threatening to eat you up, you can turn off the Thermacell repellent system and use only the lantern. During the day, if the bugs are on the prowl, the repellent system can run without the lantern being turned on. The lantern offers four light settings: low, medium, high, and a blinking SOS. At its highest setting, the D-cell batteries can produce 300 lumens for up to 50 hours. That’s quite a stretch, but there’s no need to set your watch to know when the juice is running low. An integrated battery life indicator in the on-off switch housing shifts from blue to yellow to red as the battery life diminishes. At the heart of the Thermacell repellent system is a butane cartridge that heats a metal grill. Repellent-infused mats are heated by the grill, allowing for efficient vaporization and dispersal of the repellent. Refills are offered in 12-, 48-, and 120-hour quantities. As we mentioned, the Thermacell insect repellent system is comprised of a butane-powered heating module, a metal grill, and a repellent-infused mat heated by the grill to vaporize the repellent. This system sits on top of the lantern for maximum repellent dispersion. Each butane cartridge last for 12 hours, and the repellent mats work up to four hours. Thermacell offers replacement cartridges and mats in measured packs covering 12, 48, and 120 hours (1 cartridge/3 pads, 4/12, and 10/30, respectively) so that you always maintain a proper cartridge-to-mat ratio. 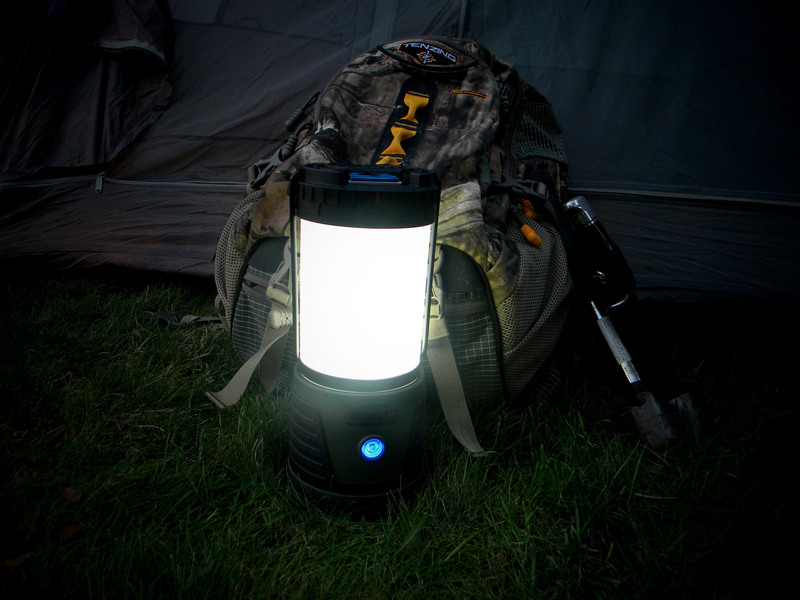 Two-in-one products often fall short of their claims, however, we found the Thermacell Repellent Camp Lantern to meet all of our requirements…and then some. That the Thermacell system would do it’s job on little winged demons was a given. That this lantern would rate with the high quality camping lanterns we’ve tested over the years proved to be a major bonus. For these reasons, the Thermacell Repellent Camp Lantern is the new “must-have” in our gear stash for camping during the biting-bug months. Article copyright 2015 by Outsidedaily.com; promoted by Thermacell Repellents, Inc.
How do I get one???? Need now!!!!! This looks like a super product. Where would we find one? Heavy rains in N. Texas make it a mosquito playground day or night. Would love to have several of these! Definitely need one or two of these.